I have been thinking a lot lately about the cost of things vis a vis their actual value. That’s what happens I suppose when you become a grown-up with a mortgage…suddenly all expenditures are brought into sharp focus, to be examined and audited conscientiously. Do we really need this? Can this wait? Will my soul suffer irreparable damage if I do not purchase this immediately? This is especially relevant with the fast approaching holidays. I don’t know how it is where you are, but over here as soon as the –ber (SeptemBER…) months hit the carols start playing at the malls and every store has something bright and shiny to lure you away from your hard earned money. The gift giving here can get a bit over the top, with Christmas lists a kilometer long and gifts to be gotten for every single person you know and some you don’t…forcing many into purchases of mass “generic gifts”. In addition to this, little C’s 1st birthday is coming up (how time flies! ), and although I am beyond excited to celebrate my cherry bomb’s first year on Earth, local tradition dictates a big-splash first birthday party. I’m talking party planners, mascots, caterers, shows. And, of course, a professionally designed birthday cake. Now, I know it sounds like I’m turning all bah-humbug on you but hear me out. As far as Christmas goes, I sometimes feel like it’s turned into a merry-go-round of generic gifts and consumer gimmicks – where’s the meaning? It’s supposed to be the happiest time of the year and I’m stressed because of things that technically should not matter in the grander scheme of things – is that not more than a little ridiculous? I certainly don’t want to be cynical about Christmas (or cynical in general)…particularly when I have a little one with whom I want to share the magic. And don’t even get me started on the 1st birthday celebrations. I have already decided to eschew tradition and have a small gathering. At one year old little C will not remember all the hoopla and, I am pretty sure, will enjoy a small gathering of doting family all bent on entertaining her, as much as, or even more than, a gaggle of mascots (which if she is anything like her mother will only serve to freak her out). – Heat oil in a wok or skillet or pot that is big enough to accommodate all your prawns (in either 1 or 2 layers, no more than that). When the oil is hot add the garlic, ginger, lemongrass, and onion. Sautee until onion is soft and translucent. – When onion is soft add the chilis and aligue. Cook, stirring often, until the aligue softens and oil separates. – Add the coconut milk and continue to cook until it all melds together. Add fish sauce and lemon/kalamansi juice to taste. 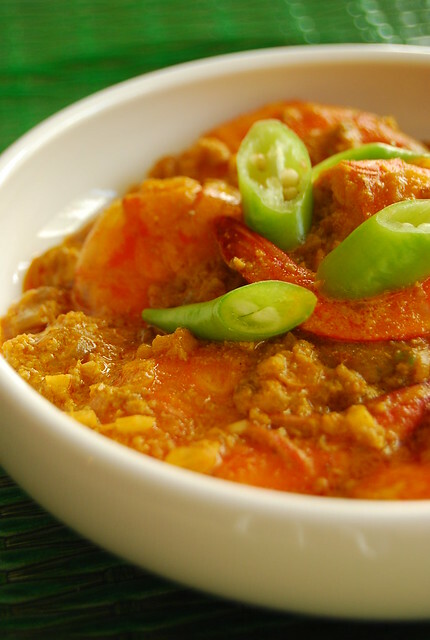 – Lay the prawns in the pan; give it a shake to coat with sauce, cover, and let simmer for about 5 minutes. Check your prawns and remove from the heat as soon as they are all bright orange. My, my. I sure have tripped the light philosophical today. I won’t bore you with my ponderings for much longer. If you too would like to simplify this coming year (or have been doing it already) I would love to hear your suggestions! Anyway, I am very interested in this dish. Heard of the crab fat before, but haven’t come across it yet. What makes a fun-tabulous kiddie party? I totally understand what you mean about Christmas. It can become meaningless in all the chaos and present overload! At least you've got your goals/resolutions worked out for the coming new year. And by the way, what a great and interesting recipe. Thanks for sharing with us. How weird is it that I was just thinking of that the other night too! I wanted to move somewhere in Pangasinan, close to Our Lady of Manaoag- a small town and thought of how nice it would be to live life simply and modestly, no pretentions. I remember my nephew's first birthday – we slaved in the kitchen for DAYS – was it worth it? Yes, he doesn't remember a thing but we did a lot of mother-daughter-sister bonding then. It was certainly memorable for us! 🙂 Would I do it again? Probably not! LOL! The sugpo sa aligue takes me back to Manila – thanks for sharing – it looks good. I absolutely love ths combo! yummy crab…the coconut milk combo sounds delish! I will die for this dish! I want to try this recipe for sure! Yum Yum Yum. I miss you, Jo, and I totally agree that massive 1st birthday parties are nothing but a waste of money. We just invited Little A's little friends over to play and held it at an indoor play area because it was a rainy day. Tinies really will appreciate fewer guests and those they know well, otherwise they will just get overwhelmed and likely not enjoy themselves. All my favorite ingredients in one dish! Delicious! I'm always trying to simplify things, but every time I try to do so – THINGS ACTUALLY GET MORE COMPLICATED! So, really, I just try to leave things be. Good for you. Planning a small first birthday party is not only sweet and meaningful, but I think your baby will appreciate it more. No confusing and noisy people, and everyone will have a better time. I hope you'll have fun with the planning. Sounds exciting, actually. Ditto for Christmas which has been reduced to a big circus of empty merriment and lavishness. First, I have to try that dish! Cooking lessons for the kitchen-impaired please, Jo! Super agree about the first birthday party. I stalled for five years! haha. I love watching little ones on Christmas morning. After all those presents have been opened.. check out what they love the most. Bubble wrap, tissue, torn wrappers and the ribbons! And that kinda puts everything in perspective. love this post! i totally agree, your little one will not remember any of her first birthday bash, and there are lots of other ways to make it meaningful other than a huge to-do. and yes, Simplify happens to be my mantra, too! I'm with you regarding over-the-top children's parties. But then again, I don't have children… so maybe I'll be guilty of that transgression if I do! You are right. First birthday (and second for that matter) is for you to celebrate. Go and eat chips in the park. Watch his joy as he sees the single candle on the cake lit. Hi Anh! I know…you have been moving around, but still seem to have everything under control and what a gorgeous new kitchen! If you have a Filipino store nearby you might find the crab fat there…you can ask for aligue or taba ng talangka 🙂 Here’s to a simpler and more meaningful lifestyle! Hi JamS! Don’t think C and I haven’t had the same kind of idea – to just live in the country and sustain ourselves there! Glad you got to bring back some taba ng talangka with you to LA! Hi Trissa! Yes I think the effort we put into these celebrations makes it truly memorable! 🙂 I’m sure it was a fabulous party knowing the gorgeousness you regularly put forth in your blog! Hi Vivienne! Love it with coconut milk! Yes, we are also finding ways to cut down…not too fun at the onset but slowly becoming very liberating! Hi Quay Po! Hope you like it! Miss you to Iyor! I hear you…we are having a very simple gathering this year and I am so looking forward to it 🙂 Let’s plan our get together soon! Hi Vicki! Thanks for dropping by and for the nice comment 🙂 Aha! So we have the same alma matter I see! And I actually have the first edition of that cookbook! Hi Chef D! That’s exactly it as well — to focus on what’s important that sometimes gets lost in the fray! Hi Midge! Hahaha! Will keep that in mind! Hi Bella! Glad to see you have more adventurous tastes than your friends! A few years ago I read a book titled "Unplug the Christmas Machine" and it was all about upping the meaning of the season while decreasing the unending expense. The decorations are great – but do we really need all those expensive Victorian ornaments all over the house? It's great to eat special foods – but does it have to be lobster and Champagne? And what ever happened to do it yourself decorations and going out singing Christmas carols? The economic slowdown has forced millions to look at a lot of what Christmas has become and ask if it really works for YOU. And maybe if you're flush with cash you might still want to watch your spending and spend on things that are more important to you. First off, let me just say how much I enjoy reading your blog…I usually don't comment but since this topic (downsizing-if you will) hits too close to home, I feel it is only appropriate. Oh my, Joey, can this get any better? All the right ingredients in this recipe, love it and I can totally imagine the taste. I almost fell from my seat when I saw your post…oh my! that something I love so much :)) aligue and sugpo is my fave! I just love foods with coconut milk! The aligue made the whole dish absolutely delicious. Make sure to have your blood pressure checked! First off, this looks PHENOMENAL, and I can't wait to try it. What would you add to make it a little spicy? Some chili flakes? And secondly, I can completely relate to the saving and appreciating what you have. I'm also going to resolve to have fewer, better quality purchases and stuff in my life. Finally, happy birthday to the Cherry Bomb! Hi Tapping Therapy…I love dishes with coconut milk too 🙂 And yes, I need to have my BP checked! Hi Bee! I love this combination of ingredients too! It looks delicious. I would love it with a slice of the gorgeous pie below! Yum… Your pictures really make me want to try new things! Thank you!